The following article was kindly provided by Ms. Michie Takeuchi, a Yoboku of Kyokushi London Mission Station. Palette was launched in 2010 with a new name and a new revamped concept. It is built upon the ideas that founded its predecessors, the GTC (Green Tea Club) and ‘The young people’s convention’. Mainly consisting of group workshops/discussions, their aims were to create an event where young people in Europe could come together to talk about their faith and experiences. GTC was originally formed by Mr Fukaya who was at the time a student in Germany. It was initially intended as a platform for group discussions and debates in the hope that people could learn from each other’s experiences. Unfortunately after Mr Fukaya went back to Japan, GTC naturally dissolved, but the idea itself, and the need was never extinguished. Thus it made a comeback, this time as ‘Young people’s convention’. It too focused on group discussions and its target age was from 15–40. However, the re-launch did not meet our expectations, and the name was not appealing to the mature participants. There were also opinions that the discussions needed to be refined with clearer concepts. The idea of there being a theme each year was thus adopted. In this way, slowly there was a growing movement for change. At this stage, younger staff had already been invited as the voices of the next generation, and their input was already making small changes. The first situation they tackled was the name. They wanted something catchy, something that would appeal to the young and equally inviting to mature participants. After 2 months of exchanging ideas, it was Kyoko Nederkoorn from Holland who suggested the name ‘Palette’. 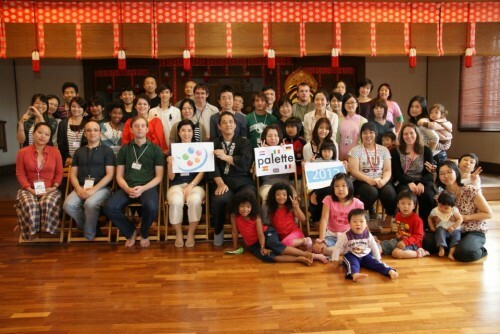 This summer (August 24–26) the third Palette was held at Tenrikyo Europe Centre (TEC) with 30 participants from 6 different countries. Following on from the theme ‘Fragrance’ in 2010 and ‘Colour’ in 2011, the theme for 2012 was our ‘Bodies’. To be truthful, as a participant, my initial thoughts were that it would be quite a sensitive subject for some, and was slightly weary, yet curious about how it would be approached as well as how it would be received. However, pondering over it now, maybe it was exactly right for Palette. Why? Well it’s the kind of thing that could only be talked about with people you trust and feel comfortable with. In other words, once you can open up about a topic such as this, you’d soon be able to open up about other things. Thus we can have an honest open discussion. Obviously this is something that doesn’t occur overnight, or even 2.5 days, which is how long Palette is currently. 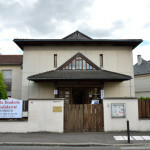 However, each ‘Palette’ is a step towards achieving a tight community in Europe. Not only does it give you the opportunity to reflect upon yourself, but you can also explore other perspectives. Moreover, it is somewhere you can comfortably discuss with others who are all connected by one hope—to realise the Joyous Life. For those who come without knowing our shared goal, Palette may well be the trigger! In a different sense, Palette can be a trigger for communities to form in each of the countries. I definitely feel this was the case for the UK where I am from. A total of 6 people participated from the UK this year. Although I knew each participant already, some who I’ve known for years, it was a really great opportunity to get to know them properly. Although some I see at the monthly service every month, it’s not often that I would have a long conversation with them or share ideas. But now after Palette, I feel I want to take home the experiences and keep the Palette energy going in the UK. New friendships formed this summer, so I definitely do not want to put them to waste. I’d like to take every opportunity as possible for young people to gather in the UK. What I’d like to keep in mind, is although Palette has the potential to be revolutionary in Europe… it’s the most natural revolution really—People connecting with other people. All you need is a place and some enthusiasm. In terms of how the topic was approached, I personally thought it worked really well. As highlighted by our group leaders, when we talk about our bodies, it tends to be about the negatives. Whether with friends or colleagues, we tend to pick out parts of our bodies we don’t like, or why we don’t like our bodies. But maybe that’s exactly why it seems like a sensitive issue. In contrast, in our group work, we focused on what we liked about our bodies. The programme also incorporated games using our five senses in the park near the centre. We also talked about which part of our bodies were particularly important to us, and tried to rank them. It was an impossible task though! Which made us realise how precious our bodies were, and how each body part was just as important in making us who we are. Although at first glance it was a simple exercise, I personally got a lot out of it. It was the teaching of ‘a thing lent a thing borrowed’ in a light, approachable way. It also made me appreciate the diversity I mentioned earlier amongst our group. We talked about body language, and it was really interesting to pick up on different habits that made each of us unique. I think as well as finding a common ground within Palette, it is also nice to celebrate diversity. I personally feel, the more diversity there is in the Tenrikyo community, the more we can reach out to people and help in our own unique way! “Individually, none of you may be able to run as fast as an Olympic athlete. But together, you are an All-stars Team,” explained Reverend Hasegawa, Head of Tenrikyo Europe Center at the opening ceremony. “Palette will be different every year, but for each year God the Parent has handpicked the participants and the right circumstances, thinking about each individual’s happiness.” I think we were all able to understand his words as the programme progressed. Personally, I was able to learn a lot from listening to others and it helped me to reflect own my own faith. I think also for most, it was a great moral support in itself to know there are other young followers in Europe. Back when the GTC was formed, there was no Facebook and social networking sites weren’t what they were now. So even knowing the existence of other followers in Europe was not easy. Today, connecting and keeping in touch with those out of reach is even more possible, and so it is exciting thinking about what we can develop from here. So how will Palette grow from here? “We want Palette to be somewhere you’d be happy to bring your friends along to.’’ i.e., somewhere for both new faces as well as familiar faces mature in the faith. “For that we want to keep innovating it and always want to keep it fresh and in keeping with the times.’’ These are the promising voices from the current committee. “It’s also for those who are not just young in age, but young in terms of faith. Those include people who were introduced into the faith by their partners. Moreover, it includes those who may have been born into a Tenrikyo family but are still yet to find their faith in the real sense. Ideally we obviously want them to participate in other events such as the Yoboku reunion, but sometimes they may find it difficult to voice their opinions at these kinds of events,” says Miss Nagao. I personally can strongly relate to the second point, as I am sure many of you can do too. When born into a Tenrikyo family, you are, from birth, Tenrikyo. But, I feel most of the time, our real Tenrikyo age is much less than our real age. We all have a point or points in our life where we discover our faith for the first time, by ourselves. Whether it be a significant event, a series of events, or an individual, it is something that helps us find our sincerity. Sometimes it is just a matter of giving yourself time to reflect on your faith. Through that, in some cases you may discover that you had always had it, but just had not realised it. I believe in all these different ways, Palette will become important in the supporting of ‘young’ people in Europe, including myself. Palette’s aim is the ‘mixing’ of ideas, opinions, and mixing of people. Each participant brings a new ‘colour’ to the table, and that’s how we can start to realise a better brighter future.